Keep your food fresh for up to 5x longer with the FoodSaver® Portion Pouch Rolls. These food preservation rolls are perfect for creating your own bags to vacuum sealing and store leftovers and individual–size portions with your FoodSaver® Vacuum Sealing System, or for bulk-sealing your food twice as fast. 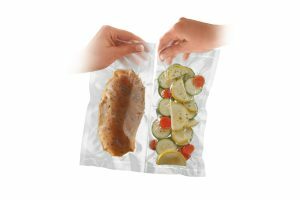 The FoodSaver® Portion Pouch rolls are perfect for vacuum sealing and storing leftovers and individual–size portions, or for bulk-sealing your food twice as fast. 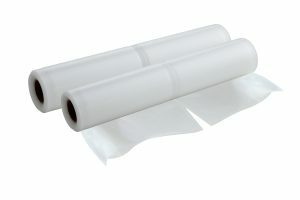 The Portion Pouch rolls are perforated in the middle to allow for sealing two things at once. Save individual chicken breasts, steaks or fish fillets so you can freeze and save for later. Or, use the bags as portion control – save meat in one side and a portion of vegetables in the other so you can save individual meals at a time. Perfect for meal planning or controlling portion sizes.